After continuing our journey with John Crichton last week with “Thank God It’s Friday…Again” and “PK Tech Girl,” our Farscape re-watch continues this week with the eighth and ninth episodes of Season 1. And now we come to yet another episode that completely belies the general notion that Farscape only started getting dark after Scorpius was introduced in the epic two-parter, “Nerve/The Hidden Memory”. Correct me if I’m wrong, but I don’t believe that most lighthearted space shows feature one of their regular characters–a mystical priest, no less–torturing a tiny, adorable, two-headed alien creature, do they? But I’m jumping ahead of myself. The premise of “That Old Black Magic” is that John is kidnapped–or perhaps soul-napped–by a powerful sorcerer called Maldis, a sort of energy vampire who feeds on peoples’ life forces–particularly their strongest, most negative emotions–and who has all but completely drained the life out of his entire planet and its people, and so when fresh supplies, so to speak, arrive in the form of Crichton and his friends, Maldis sees them as a perfect opportunity for a new food source. John is his first target, not only because he is a new life form to him but because–using his ability to read minds–he can tell that Crais’ hatred of Crichton could prove a perfect meal of hatred and retribution. He’s a strong enough wizard that he is able to reach out and pull Crais’ soul into his fortress, as well, at which point he encourages the two to fight and kill one another for his nourishment, a game that Crichton eventually figures out himself, a demonstrations of his intelligence and scientific, analytic mind trumping Crais’ brute strength. Farscape did something very interesting with Crais in Season 1, and that was to not show him very often. Rather than having him be a sort of Wile E. Coyote figure who we saw each week nearly catching John, only for him to slip out of his grasp each time, Farscape actually spoke of Crais more than we ever actually saw him. In TV Land, six weeks is a long time to go in between sightings of the seeming Big Bad, and when we do see him again, it is in this unusual capacity, magically transported into a labyrinthine mind-castle where he can have the opportunity to kill his hated enemy. Interestingly, Crichton’s gambit in “Exodus from Genesis” to try tricking him into thinking humans might be able to replicate themselves exponentially doesn’t seem to have worked. I wouldn’t be surprised if Crais just attributed the commando unit’s report to their heat delirium. He is so determined to consider Crichton an inferior being and so hellbent on killing him, he simply disregards any evidence to the contrary. Another interesting thing this episode does is to humanize Crais to a degree while at the same time painting him as an even bigger, more dangerous, and genuinely unbalanced threat than the first time we saw him. His initial appearance in “That Old Black Magic” is significantly different than in “Premiere”. Whereas before, he seemed meticulously put together and controlled, now he is starting to look unkempt, obsessive, exhausted, his hair and emotions a bit frayed. He has been tracking Crichton for what seems to be many weeks, if not months, and beyond pushing his crew and himself to the breaking point, his failure to deliver the human to his superiors back in PK space is making them start to lose faith in his abilities, an aspect we may not have thought of before now–that Peacekeepers are an upwardly mobile bunch, always ready to pounce on the first sign of weakness, meaning that no matter what position you hold, you have to constantly fight to retain it. At any moment, you could be sold out to make way for your inferior taking over your job (which will eventually set a precedent on the show for Big Bads, even Crais, eventually becoming allies with Moya’s crew against Bigger Bads). Ironically, in this episode, Crais’ second-in-command would have done well to sell him out, because her refusal to do so leads to her death at the end, when he repays her loyalty by snapping her neck in order to keep the fact that PK Command has ordered him to leave the Uncharted Territories a secret (again, not a light, happy show!). In addition to showing how Crais is starting to come undone, the episode further humanizes him to both Crichton and us by revealing a bit of his background. We learn that he wasn’t born as a Peacekeeper but that instead, at a very young age, he and his younger brother, Tauvo, were conscripted from their small farming community into Peacekeeper service, taken away from their father, who charged the young Bialar with always looking after his sibling, a promise that he upheld for all of these years until Crichton’s module accidentally killed him. For the first time here, we really come to see Crais as a person–as a heartbroken brother experiencing genuine loss and suffering, and Crichton and we can start to relate to him on that level. Except for the fact that, at the same time, this makes him even scarier and more threatening, because it is clouding his judgment, making him refuse to listen to reason. For each of John’s passionate and well-reason arguments–and one can tell that he is truly remorseful, particularly now that he realizes that underneath his PK exterior, Crais is a person in mourning–Crais only grows angrier and angrier, refusing to emerge from this scenario with any other outcome than Crichton’s death. 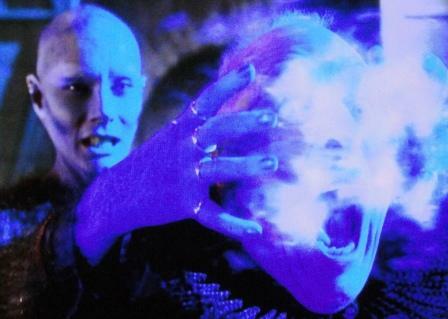 It also doesn’t help matters that, in his madness, he is even more susceptible to Maldis’ manipulations, particularly when the sorcerer shows him a vision of his brother’s charred corpse.